The back is the softest Robert Kaufman flannel ever and the sparse quilting makes it extra snuggly. A while back I bought aqua and orange material for a quilt and I haven't got around to it yet. I was just thinking about it this weekend and starting on a quilt pattern for it…and now that I see this, I just want to get working on it right away. GREAT JOB, i reallt like it! 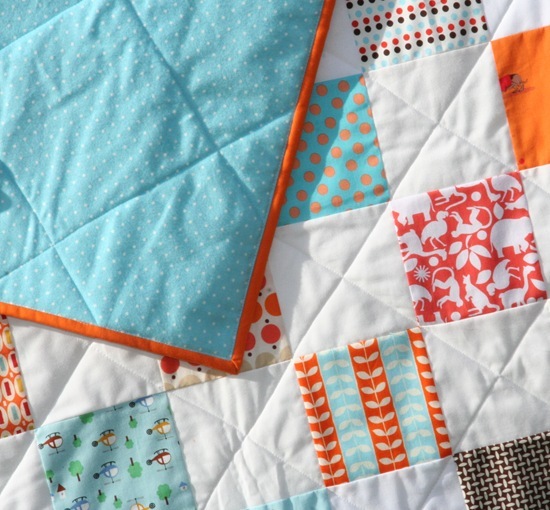 FYI: I'm thinking about using one of your tutorials for mine..the orange quilt one or mary's quilt. Love it! I'm going through a major orange phase right now! So cute! I love orange!! it's beautiful. I just discovered Heather Ross this year, so far I've only tracked down some of her mermaid prints, those dogs are adorable! I think I'd have a hard time cutting them up to sew ! Love it!! The color combo is fantastic! I may have to get some of that cozy flannel in my stash soon too! oooooooo, orange! I love what you have done with those fabrics. Great job, and it does look really snuggly! Great Quilt! You are so inspiring with all your great designs and ideas! i've been sewing for quite some time but quilting is pretty new to me and I love your tutorials! I love the mod flower fabric. This is such a fun, colorful quilt. Great job! Orange is such a wonderful happy colour for both sexes and should be used much more often . I adore all shades from the brights to the shades of Autumn. Thanks for showing it beside other fresh colours making it so much fun! oh, so sweet! I used the last of my Heather Ross fabrics in a quilt I'm still working on. I held onto them far too long and it feels good to finally put them to use. I LOVE the helicopter print! Who is it by? I searched online and couldn't find it. I have 2 little boys and finally made my first quilt for my older one after finding your blog! Thanks for all the inspiration! I love how you quilted this…so cute. Great quilt!!! I love patchwork. 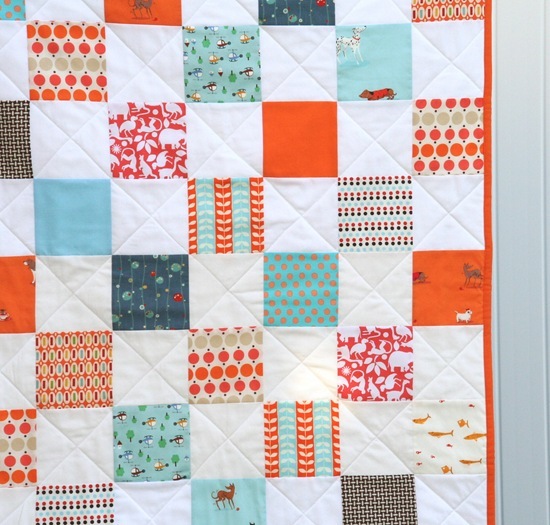 I LOVE YOUR PUPPY QUILT, SO FUN AND BRIGHT.